This book will teach you how to make money with your writing, whether it's from your blog, digital products, eBooks, courses, paperback or hardcover books, freelance writing and another form of written content. It covers the elements of self-publishing and how to get started within minutes of finishing a book, the pros and cons of both traditional publishing and self-publishing, how to grow your email list, how to make money through content marketing, the best ways to use affiliate income opportunities, how to earn money as a freelancer, and how all of these opportunities are making incomes for writers who have chosen to focus on their creativity to educate, inspire and entertain readers. If you've ever wondered how you can turn your profession and existing career into an income-generating opportunity online, this book is worth reading. If you're new to self-publishing or what to get help learning the process of the book publishing business, definitely pick this book up to learn more. 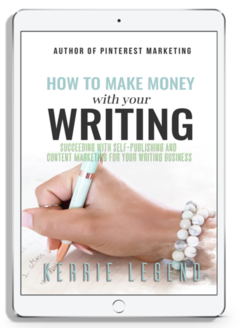 This book covers all the elements that go into writing and producing written material and preparing it to sell. You'll learn about growing email lists, making content upgrades, connecting with readers, finding your tribe, marketing your writing and finding ways to challenge yourself to expand your audience.